AS IT STANDS: 2 Reasons Why I Love Tasmanian Devils: First One, They're Going To Help Save Millions Of Lives! 2 Reasons Why I Love Tasmanian Devils: First One, They're Going To Help Save Millions Of Lives! When it comes to Looney Tunes cartoon characters Taz ranks in my top three with Leghorn Longhorn, and Daffy Duck. I know that real Tasmanian devils aren't as cute as the cartoon character (I realize it depends on what you call cute). To some, they look like a rat on steroids with their sharp teeth and coarse black, or brown fur. They may not be very big, but don't be fooled by that. When the devil feels threatened, it goes into a rage in which it growls, lunges and bares its teeth (Sort of like Trump supporters right now). It also makes otherwordly screams that can seem very devil-like (Trump on the stump)! 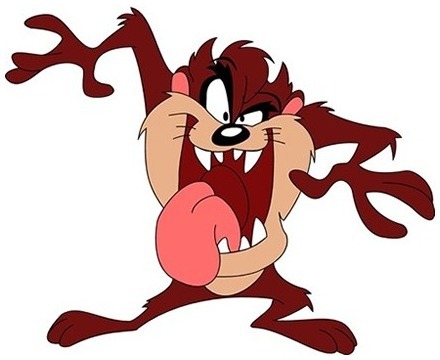 Seeing the cartoon Taz spinning around may seem cute, but to it's enemies it means it's time to run. So basically, devils aren't very sociable. Kinda like me. That's why I find it interesting that scientists are saying these solitary creatures may help mankind fight "superbugs." Those mercurial marsupial's milk may be the global answer to combating the increasingly deadly superbugs which resist antibiotics. Now, I have another reason to love Tasmanian Devils. When is a journalist, not a journalist?